"VENICE DESIGN 2016" in one of its prestigious Palazzi in Venice, Palazzo Michiel. 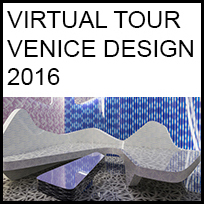 VENICE DESIGN 2016 is the largest exhibitions to show current design developments during the Venice Architecture Biennale. It brings together an international set of designers of diverse cultural background, young, senior, established and emerging. Samovar Carpets (KWT); Alessandro Mendini and Kang Keum-seong, Chung Mi-sun, Chung Yong-hyun and OCDC (ITA -KOR); Arend Groosman (NLD); Ariel Zuckerman (ISR); Atocha Design (USA); Brigi Konda (HUN); Chapel Petrassi (ITA); Creative Chef (NLD); Ditte Trudslev Jensen (DNK); Eckhard Beger (CHE); EDGE Collections (USA); Frédéric Hernandez (FRA); Gunjan Gupta (IND); Karen Michelle Evans (GBR); Karim Rashid (USA); Kati Meyer-Brühl (DEU); Kino Guérin (CAN); Maria Volokhova (DEU); Nynke Koster (NLD); Pascale De Backer (BEL); Paul Kelley (GBR); Robert A. Wettstein (CHE); Sang Yoon Kim - Listen Communication (KOR); Satyendra Pakhalé (NLD); SoFarSoNear, Sans Souci, Katherine Richards Design (ITA - CZE - GBR); Studio Silvia Knüppel (DEU); TuominenPatel (FIN); Ueberholz GmbH (DEU).